Loras F. Stecher, 76 of Dubuque, formerly of Sherrill IA died on November 8, 2018 peacefully in his sleep after a lengthy battle with cancer. Mass of Christian Burial will be at 10:30a.m. Monday, November 12th, 2018 at St. Peter and Paul Catholic Church, Sherrill IA, with Rev. Noah Diehm officiating. Burial will be in the church cemetery, with the Sherrill Fire Department Firefighter Ceremony of the Four Fives. 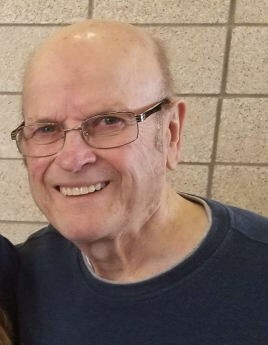 Friends may call from 2:00 p.m. to 6:00 p.m. Sunday, at St. Peter and Paul Catholic Church where a wake service will be at 1:30 p.m., and the Sherrill Fire Department will meet at 4:00 p.m. Leonard Funeral Home & Crematory Dubuque, Iowa is handling the arrangements. He was born on June 5, 1942 in Sherrill, son of Anton and Leona Stecher. In 1962, he married Susan R. Schlung, who preceded him in death in 2005. In 2009, he married Jeanne Nuehring, and he is survived by her. Mr. Stecher was a graduate of Loras College. He worked with his brothers Vic and Noel for their trucking companies Key City Moving and Storage and Budget Rental. Loras also worked on his family’s farm in rural Dubuque, where he built his own home and raised his family. Loras never met an ice cream flavor he didn’t like and was never one to complain about anything. He enjoyed his trips to the casino “visiting a sick friend” as he would call his casino trips. He earned the title of professional shopping bag holder as the only male in his all-female household. He always found a way to make treasures out of anything he found and could fix anything. Loras was involved in the community as a member of the Knights of Columbus, a Toastmaster, and a volunteer with the Sherrill Fire Department. He was very active in St. Peter and Paul Church as a lector and usher. Surviving are his wife Jeanne; five daughters, Laura (Jeff) Janco of Methuen, MA, Christine Wilson (friend Mike) of Fitchburg, WI, Theresa (Paul) Reardon of Stow, MA, Jennifer (Richard) Parkinson of Hudson, NH, and Angela (Scott) Hanz of Middleton, WI and his step-children Julie Nuehring-Konzen (friend Mike) and Kevin Nuehring of Dubuque; grandchildren, Chad (Alicia) Pusateri, Zachary, Nicholas, and Sarah Janco, Justin, Eric (Dwijavanthi), Matt, and Lexi Wilson, Bennett Parkinson, Hannah Reardon and Sophia Hanz and step-grandchildren Emily and Lauren Konzen. He also has two great granddaughters, Ella Pusateri and Naya Wilson. He is also survived by his brothers Noel (Pearl) and Joe (Carol) Stecher, and his sisters Eileen Fischer, Lorretta (Alfred) Behnke, and Joyce (Jerry) Schmitt, as well as numerous nieces, nephews, and cousins. He was preceded in death by sisters Lorraine Aird, Mary Hirsch, brother Victor Stecher and brothers-in-law Clem Aird, Al Hirsch, Lawrence Fischer, and sister-in-law Lou Stecher. In lieu of flowers, memorials may be sent to Hospice of Dubuque. The family wishes to thank Dr. Eric Engelman and his staff, Dr. Christopher Stille and his nurse Amanda along with the nurses and staff at Mercy Medical Center, Manor Care and Hospice of Dubuque for their loving care and concern for Loras and the family. A very special thank you to the Behnke Family for all their love and support. “Enjoy the little things in life because one day you`ll look back and realize they were the big things.” Thanks Dad for the pajama races, $2 bills, trips to the planetarium, scratch off lottery tickets, postcards, your cookie sandwiches, and the grasshoppers.